While Johannesburg is often referred to as the business capital of Gauteng, many people also travel to Pretoria on business. Pretoria is the administrative capital of South Africa, as well as the diplomatic hub of the country. Home to the Union Buildings, many international embassies as well as international ambassadors – there are many reasons to be in Pretoria. Here are a few hotels to check out if you are travelling to Pretoria on business. This listing includes accommodation options for those travelling on a budget, those seeking high-end luxurious hotels, as well as those seeking the smaller, more intimate accommodation in a boutique hotel or guesthouse. Whatever your needs, you should find the perfect place to rest your head in Pretoria. Morning Star Express Hotel: When all you really need is a comfortable place to spend the night in between meetings, then the Morning Star Express Hotel in Pretoria is perfect. Located in the centre of Pretoria, close to many government departments, the Magistrates and High Courts, and many major businesses, the Morning Star Express Hotel is many business travellers’ preferred rest stop for a night or two. The accommodation is very affordable and perfectly comfortable with all of the amenities that you need. Holiday Inn Express Sunnypark: This simple yet modern high-rise hotel offers what you’d expect from the Holiday Inn Express brand: comfortable but no-frills rooms, friendly service, and decent food. Facilities include an outdoor pool, direct access to the Sunnypark Mall, and close proximity to dozens of government offices and businesses. However, the neighborhood it’s in is a bit lacking in amenities and style, so don’t stay here if you’re wanting to go for an evening stroll. Arcadia Hotel: The Arcadia Hotel, which has been business since 1975, offers excellent service and supreme attention to detail. They make their three stars count by catering for what every business traveller needs – comfortable air-conditioned rooms, free Wi-Fi, satellite TV, a complimentary shuttle within a 5km radius, and delicious food to keep a grumbling stomach at bay. If you want a simple hotel stay that will cover all your needs, then the Arcadia Hotel will become your go-to hotel in Pretoria. 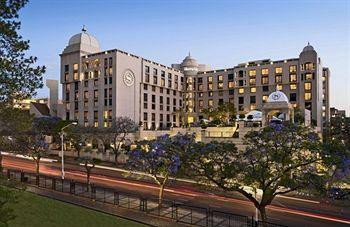 The Sheraton Pretoria: This is definitely one of the more stylish hotels in central Pretoria. The lobby makes you feel as if you stepped into a New York city hotel circa 1940, with its five-story high atrium adorned with painted frescoes, marble floors and columns, mahogany wood furnishings, antique ironwork, and burbling fountain. Rooms are plush and spacious, and amenities such as the pool, restaurant, bar and concierge are all top-notch. Even check-in is lovely, with individual desks where one can sit while registering, rather than the usual monolithic counter. If you have business in the Union Buildings this is an ideal hotel to stay in, as it’s located directly opposite. The Premier Hotel: Centrally located in the heart of Pretoria, the Premier Hotel is close to all of the major business districts, government buildings, the university, embassies, Loftus Stadium and historic attractions – and overlooks the Union Buildings. This hotel is for the discerning business traveller, having all the bells and whistles expected of a luxury travel experience including top notch boardrooms and conference rooms. The 89 deluxe rooms, 24 executive rooms and 5 suites are all adorned with classic interiors exuding comfort and sophistication. It’s the perfect place to sit back and relax after a long day of meetings. You can also please your stomach with the delicious fine dining in the Ambassador Restaurant, serving breakfast, lunch and dinner. And enjoy a sundowner at the Embassy Cocktail Bar and Lounge while admiring the view of the city. Court Classique Suite Hotel: The Court Classique Suite Hotel is situated in the up-market and picturesque suburb of Arcadia in Pretoria. It’s very close to major business centres as well Loftus Stadium (in case you are keen to catch a rugby game during your stay). It’s also not far from great restaurants, cinemas, shops and other cultural attractions. They have four-star accommodation, a restaurant, a bar area, Wi-Fi, shuttle service, gym vouchers, boardrooms, conference facilities and other personal services to cater to any and every need you may have. Velmore Hotel and Conference Centre: While the Velmore Hotel and Conference Centre isn’t as centrally located as some of the others on this list (about 15km from both Pretoria and Centurion), it is worth the short trek if you are planning a big conference or event. Sitting on the banks of the Hennops River, with French Provencal architecture and luxurious accommodation, the pure beauty surrounding you may be the only thing distracting you from getting down to business. Velmore has conference facilities suitable for big and small groups. All conference rooms are decked out with a bar, facilities, parking and security, and expert technicians are available. Delicious meals are also served for conference delegates and hotel guests. Capital House Boutique Hotel: Capital House Boutique Hotel is a five star boutique hotel situated in the middle of the diplomatic district of Pretoria; while dining you are very likely to encounter visiting diplomats from around the world. It is adorned with spectacular furniture and decor that has been gathered from around the world, from 100-year-old doors from Egypt, to hand-carved copper elephants from India. Capitals’s rooms are decked out with large antique partner desks, leather executive chairs and Wi-Fi for those who need to work late into the night. The family suites can be converted into luxurious rooms with office and lounge space for the long-term business traveller. Brooklyn Manor: Step back into the ‘olden days’ at this beautifully restored manor house in Brooklyn, originally built in 1927. Known for its tree-lined avenues, Brooklyn is a beautiful suburb not too far from the centre of Pretoria. This elegant and homely guesthouse is perfect for the business traveller who wants a haven to relax and feel completely comfortable after a long day. The spacious rooms all open onto the courtyard where you can enjoy all of your meals as well as spend some ‘down time’, and you can perhaps even take a dip in their glorious pool on a hot day. Lombardy Boutique Hotel: Surrounded by beautifully peaceful gardens with soothing water features and regal trees, Lombardy Boutique Hotel in Lynnwood, Pretoria is a cozy and elegant upmarket hotel. It offers 20 luxurious suites, each individually decorated with understated yet extremely stylish décor, and a fine dining restaurant with distinct and experimental flavours that ensures you won’t have to venture far to enjoy a good meal. Top quality conference facilities and boardrooms offer delegates a chance to feel as though they are ‘getting away from it all’ and concentrate with a clear mind. Up to 200 delegates can be catered for in the Casa Milano venue alone. There also smaller areas available for formal and informal gatherings and events. And of course there’s also the Soulstice Spa to soothe aching muscles and tired bodies.